Mexican muffins, called Mantecadas in Mexican bakeries. They are easy & quick to make sweet bread. Sweet bread has a culture of its own in Mexico and is a tradition that has been embraced and deeply loved for generations. We have primarily Spain and France to thank for that, as their influence is why we have such a passion for sweet pastry and pieces of bread plus a love for that classic combination: coffee and bread. The shapes and flavors of Mexican sweet pieces of bread amount to more than a thousand, each one with its unique and sometimes picturesque names, like: bows, braids, kisses, brides, bicycles, stones, baldies, lovers, bricks, yoyos, and rails, just to mention a few. We obviously cannot forget to mention the famous “Conchas”, which resemble a seashell and come in many flavors. Among these baked treats are yeast pieces of bread, puff pastries, cookie-type pieces of bread, and cake-like pieces of bread, like these delicious bread “Mantecadas”, which are really quick and easy to make in your oven. 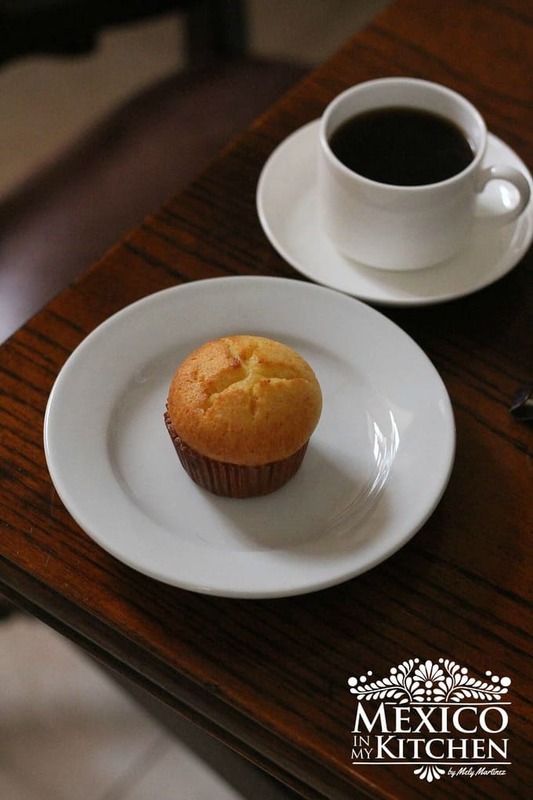 They’re perfect for having a late afternoon coffee with, or for a weekend breakfast in bed, or even for when you have last minute visitors coming over for a cup of coffee or tea. Mexican bakers are usually men that have learned the trade from one generation to another; some arrived at the baking business as an apprentice, starting their career in bread making from there. Thanks to the internet and social media, I’ve met quite a few of these men, called “panaderos” in Mexico. Some have many years of experience and are now teaching the younger aspiring bakers in Mexico, as they want the Mexican Traditional Bakery to be preserved. They are always happy to share their expertise with me and answer my many questions about baking, and for that, I am very thankful. But there are also many newcomers, the young bakers, who graduated from culinary school and have fallen in love with bread making, like my friend Hector M. Oliva Balderas, a young man only in his mid 20’s who’s opened his own bakery in the small town of Teotihuacan. Being a baker is hard work, but that doesn’t stop him from his dream of keeping the tradition of artisanal bakery alive. He even delivers his bread on his bicycle a couple days a week. I hope that there’ll be more young people like him out there keeping our customs and traditions. I’m so proud of this young man. A promise for the future of Mexican bread making. Sift together flour, baking powder and yeast in one medium size bowl, and set aside. Place egg and sugar in a large bowl and whisk until sugar has dissolved. Add milk and the flavoring of your choice and mix. Incorporate the oil in a gentle stream and whisk again to form a homogenous mixture. Slowly stir in the dry ingredients plus the pinch of salt, mixing gently until you have a very uniform batter. Do not over mix. Let the batter rest for 15 minutes. With the help of a pitcher or a ladle, pour the batter into the already prepared muffin pan. Fill it up just a little bit below the edge. See picture above. Carefully place in the preheated oven and bake for 20 minutes. Remove from oven and cool for about 5 minutes on a cooling rack. They keep well for 2 to 3 days when stored in an airtight container. Mantecadas - Sweet bread has a culture of its own in Mexico and is a tradition that has been embraced and deeply loved for generations. We have primarily Spain and France to thank for that, as their influence is why we have such a passion for sweet pastry. Bowls whisk, measuring cups and spoons, muffin paper liners, muffin pan, pitcher or a ladle to pour the batter. Preheat oven to 400F. Place muffin paper liners in muffin pan. Add milk and the flavoring of your choice (vanilla, orange essence plus orange zest) and mix. 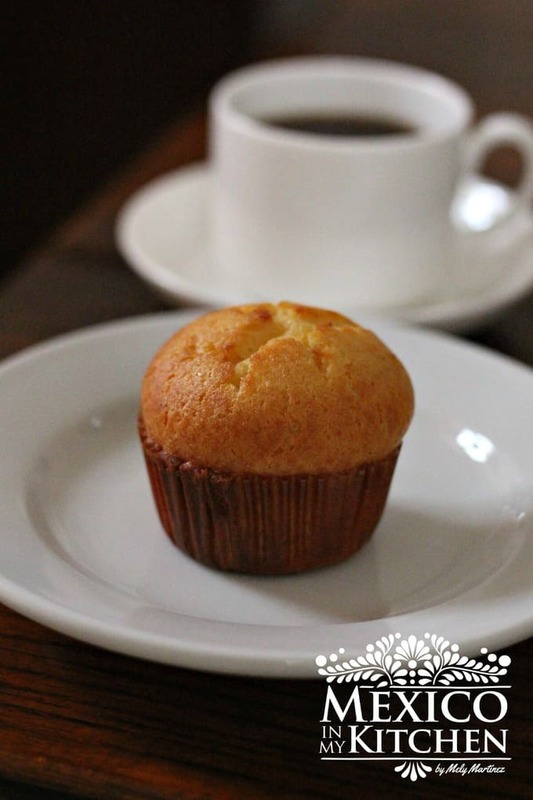 With the help of a pitcher or a ladle, pour the batter into the already prepared muffin pan. Fill it up just a little bit bellow the edge. See picture above. *First and foremost, I will suggest that you buy a small kitchen scale, they are not that expensive, and are an essential tool for bread making. Baking is more like a science, where in order to have excellent results, your ingredients have to be measure using a reliable tool like a scale. **Every baker chooses the flavoring of their choice. It could be vanilla, orange, cinnamon or almond. Previous Post: « How to make the popular spaghetti a la crema | Quick and easy. Baking is a similar to chemistry if you change some of the ingredients you won't get the same results. Please follow the recipe as directed and you will have beautiful muffins. Las hice y quedaron riquísimas, mejor que en la panadería y la mejor receta, Gracias. Mely, las hice siguiendo la receta pero quedaron muy planas. Que puedo estar haciendo mal? Pueden ser varias cosas, que la levadura o el polvo de hornear ya no estuvieran frescos, que el horno no estaba a la temperatura adecuada, que se haya abierto el horno mientras se horneaban. Trata de prepararlas de nuevo, es una receta muy sencilla y a veces no nos percatamos que algo no este del todo bien al prepararlas. Muchas gracias por ésta super receta de mantecadas, las amo! Todas tus recetas y fotografías son maravillosas! Solo se le pone seca como indica las instrucciones. Happy baking! I’m so glad you like them! Happy baking and provecho! Unfortunately I have gluten sensitivity so I’d have to substitute the AP flour for GF flour, cross my fingers they come out good! I hope it comes out ok for you. Happy cooking! I had never try making them without the yeast. But you are welcome to try adding more baking powder. Yummy! These look like treats my Grandmom used to buy at a Spanish bakery. I can’t wait to bake these for her. I hope you make them soon, they are easy and quick to prepare. I was wondering if you can use a stand mixer, or if it has to be done by hand? My whisk broke and I haven’t replaced it yet. I had never used my stand mixer to make mantecadas because they are really easy and quick to make. But, you can absolutely use it if you want to, especially if you are making a large quantity. Thank you for trying the recipe for Mantecadas. Now, you have to try the recipe for Bread Pudding, it is another great hit with our readers. Espero me compartas foto de las mantecadas en Instagram. Y de tu niña también. Hola Ivonne, estas en instagram? Puedes publicar la foto en tu cuenta o en tus historias. Y agregas @mexicoinmykitchen de esa manera la puedo ver yo tambien. Si la pubique la pudo ver? si, tienes que usar levadura y polvo de hornear. Yes, you have to use yeast and baking powder in this recipe. I’m actually very excited I came across this recipe. My grandmother who is 93 now, used to make this for the family. My grandfather who was blind had the the recipe in his head and would tell her how to make them. Unfortunately once he passed around 25 years ago, she hasn’t been able to make them. Now I get to try them, thank you! Que bueno que te gustaron. Saludos!